It’s time to get inspired! Floors are one of the first features of any space that guests, customers and visitors take notice of. Just think of when you go to someone’s home or walk into a restaurant for the first time. You likely look downward while walking or stepping inside to avoid falling or tripping. At that very moment you look down, you’re probably checking out the unique characteristics of the floors you are walking on – without even thinking about it. Floors have come a long way since the traditional wooden, tile and laminate flooring of businesses of the past. In fact, they’ve gone from ordinary to extraordinary! Glass floors have taken the 21st century by storm, allowing us to see what’s beneath the surface…literally. If you’ve been to one of these places before, then you know what a lasting impression these inexplicably awesome glass floors made on your overall experience. And just because glass floors are unique, doesn’t mean they can be found strictly in heightening places and attractions. Glass floors can be installed in offices and homes as well! 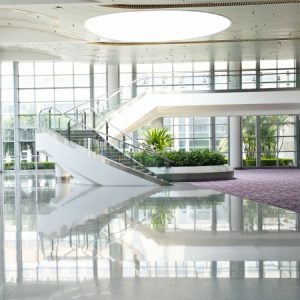 If you want your business to make a lasting first impression on potential clients and employees, consider installing glass floors throughout your workspace. Need some help with the design process? Enlist the professionals at Bent Glass Design. Contact us today!